Wordprax is a leading WordPress website development company having a team of highly talented and expert WordPress developers which always deliver high quality WordPress sites. 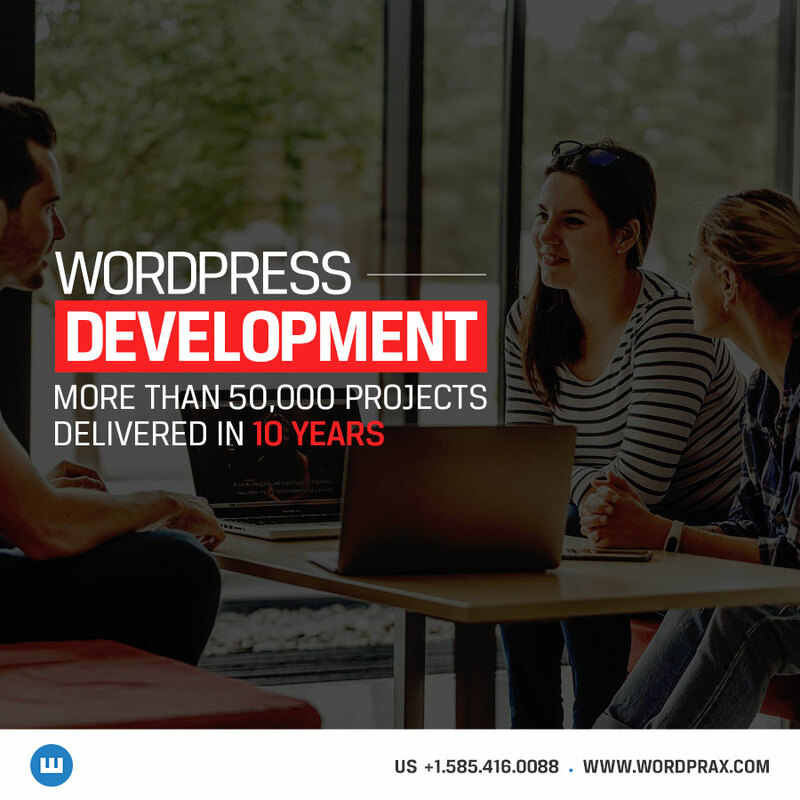 There are some solid reasons why most of the businesses choose Wordprax when it comes to selecting the best WordPress website development company. ● Wordprax has many years of rich experience in WordPress website development hence we are the best WordPress Development Company and are known for building robust, user friendly and highly interactive WordPress websites. ● Our dedicated team of WordPress developers take advantage of the latest WordPress development skills to develop highly versatile and reliable WordPress websites which have attractive designs and incomparable UI/UX. ● We have been constantly rated as the top WordPress development service for many years in a row on several online platforms and websites due to our outstanding performance and contribution in the WordPress development market. ● We believe in quality work and provide world class WordPress website support and proper maintenance services. We provide full security for your WordPress site with 24*7 monitoring. Our experts update, monitor and maintain your WordPress site while you are busy with other business operations. ● We always use the latest cutting edge technologies to build your WordPress site. ● We follow international standard processes and software development practices like Agile development methodologies while developing your WordPress site and put emphasis on proper research, design, testing and quality assurance. ● We have till now developed WordPress websites for major global enterprises. We are happy to offer you our WordPress development services whether you are a small or a large enterprise. ● We have built an impressive portfolio in these last many years of our services and therefore our WordPress developers have become master of all the skills required in WordPress development. ● We have developed WordPress sites for various industries and different sectors like finance, blogs, travel, eCommerce, education, retail, manufacturing, real estate etc. Why to go for WordPress Website Development? WordPress is right now the most popular CMS platform available to build any kind of website. As per research, right now over 30% websites on internet have been build using WordPress. The major advantages of WordPress are that one, it is open source and free hence it brings down the cost of website development considerably for so many small businesses. Secondly, it is highly customizable and scalable hence supports all kinds of businesses, even those which want to grow big in future or the ones which have flexible requirements. WordPress also has a strong online developer community which interacts a lot online with each other and help buddy WordPress developers in resolving their queries and doubts. Other benefit of WordPress is that it is SEO friendly and has very clean code hence it gets higher rankings in Google search engine results. WordPress is also responsive hence WordPress sites are easily accessible on all types and sizes of devices, screens and web browsers including desktops and smartphones. What Makes Wordprax Different For WordPress Website Development? At Wordprax, we are pretty sure and confident that we are better than the best. If you compare us with our competitors then you will find that we are far ahead than our competitors on all available parameters whether it is the quality of Website we deliver or the affordable pricing we offer for the development of WordPress website or the expertise of our development team. We are top choice of so many businesses as we provide highly flexible, customizable, scalable and reliable WordPress websites at most economical rates. If you have some requirement of WordPress website then do contact us today and ensure the guaranteed success in your business after using the WordPress website developed by us. Category: WordPress Developer, Wordpress Development and tagged wordpress developer, WordPress development by The WordPrax Editorial.